ETP sleeves are a great and economical option paralleled to the Weinig HSK hydro loc moulder heads. An ETP sleeve can give you a comparable tolerance to an HSK head while utilizing a straight bore head. ETP Hydro-Grip locking sleeves are custom manufactured to fit any machine or project. For this post we will be focusing on the industrial woodworking applications and models. The most common types of ETP hydro-grip sleeve used in the woodworking industry are; type A, type B, type G2, type G3, type GE2, type AI, type BI, and type D. ETP hydro-grip sleeves can be used in any moulder, from a 100 year old Mattison to a brand new Leadermac moulder from Centric Inc. ETP sleeves are custom made to match any moulder or CNC machine. The scientist Blaise Pascal formulated the principle of pressure propagation in liquids many years ago. 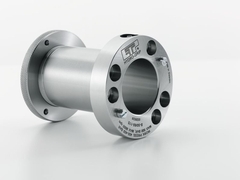 Pascal states that “A liquid confined in a vessel which is subjected to pressure distributes the pressure uniformly upon the walls of the vessel.” ETP has explored the many positive qualities in this principle, developed it further and applied it to hub-shaft connections and tool-holders. All ETP products consist of a double-walled hardened steel sleeve, filled with a pressure medium. In the flange there are one or more screws and pistons with seals for the pressure setting. All work according to the hydraulic principle: when tightening the screw an even and moderately high surface pressure is created against the shaft and hub. Mounting and dismantling is done in less than 10 seconds. The hydraulic principle gives advantages important to today’s modern machines. With increased requirements for compact designs, better concentricity/balance at increased machine speeds, shorter downtime for service and increased precision. The two kinds of assembly are permanent assembly and interchangeable assembly. Permanent assembly means that the sleeve only expands against the machine spindle. Permanent assemblies are made in short versions to allow for a light press fit. The tool and the ETP hydro-grip sleeve should be bolted together. Interchangeable assembly means that the sleeve expands, is centered and fixed in place, both against the tool and the machine spindle. The sleeve can easily be used with different tools. There are two ways to pressurize an ETP hydro-grip sleeve dependent on type of sleeve. ETP sleeves are pressurized by either using an allen T-wrench or a high pressure pump. To set the pressure with the allen T-wrench place the tool and ETP hydro-grip on the machine spindle. Turn the allen T-wrench a couple of turns and the tool is automatically centered and fastened. To set the pressure with the high pressure pump connect the pump to the ETP hydro-grip, pressurize and check that the correct pressure of 400-450 bar has been reached. We strongly recommend using Centric Inc. brand HPG2 extreme pressure lithium grease 2nd grade. For more information please contact Centric Inc. via phone at 715-848-4242 or email us at info@Centrictool.com. You can also find us on the web at www.Centrictool.com and coming soon in 2018 Centric Inc. is proud to announce our new eCommerce online store!